Traditional routing protocols are limited to less than a hundred and typically less than fifty nodes. At this point these routing protocols start to break down. They experience exponential control bandwidth and CPU usage growth, rapidly increasing convergence times and reduced responsiveness to mobility. The OrderOne Networks Mesh Network Routing Protocol is almost perfectly scalable. The time it takes a network to converge is defined as the time it takes for every node to have an optimal route to every other node in the network. Although not reflective of real world usage, it is a good benchmark to gauge the efficiency of a MANET routing protocol. The time the OrderOne Networks Mesh Network Routing Protocol takes to converge a network is dependent entirely on the amount of control bandwidth the Integrator allocates. The control bandwidth of the OrderOne Networks Mesh Network Routing Protocol is able to be limited by setting the frequency and maximum size of its control packets. For example, to limit its control bandwidth to 9.6Kbps the Integrator could configure the protocol to send four packets per second, with each packet not to exceed 307 bytes. Once the network has converged the control packet sizes can drop to less than 11 bytes - regardless of network size or the number of directly visible neighbors. The rate of convergence is directly related to amount of allocated bandwidth. If twice the bandwidth is allocated, the protocol will converge twice as fast. Below are the convergence times for simple grid networks where each node is connected on the horizontal and vertical axis. There is no packet loss and the control bandwidth is limited to 200 bytes/second. Node names are sequentially assigned IPv4 addresses. The OrderOne Networks Mesh Network Routing Protocol only generates control packets at the time interval specified by the Integrator. 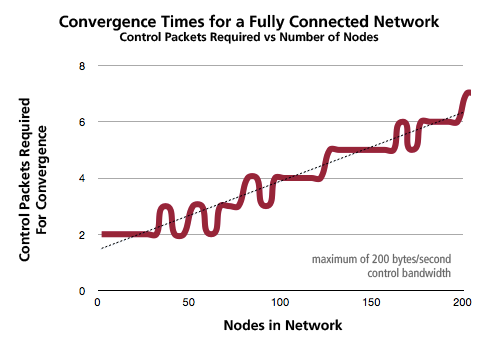 The time convergence takes is dependent on how often control packets are sent. For example, if control packets are sent twice a second, a 1,000 node network will converge in about 20 seconds. The OrderOne Networks Mesh Network Routing Protocol provides better than linear scaling with network size. At no point did the control bandwidth exceed 200 bytes/second per node. If the allocated control bandwidth was doubled, convergence times would be halved. Once the network was converged control bandwidth dropped to less than 10 bytes per packet. Traditional routing protocols have difficultly in networks where there are more than 20 directly visible neighbors. In order to keep control bandwidth within acceptable levels these traditional routing protocols will generally ignore directly connected neighbors. This causes sub optimal routes and reduces mobility performance. The OrderOne Networks Mesh Network Routing Protocol has no such limitation. Every visible neighbor is considered as a possible route. In addition, the amount of control bandwidth required to converge and maintain these dense networks is virtually unaffected by the number of directly visible neighbors. 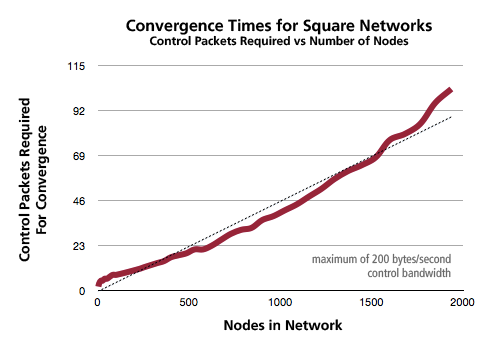 Below is a chart showing the convergence time for networks where every node sees every other node. As before, there is no packet loss and the control bandwidth is limited to 200 bytes/second. Node names are sequentially assigned IPv4 addresses. As before, if the allocated control bandwidth was doubled, convergence times would be halved. The OrderOne Networks Mesh Network Routing Protocol only generates control packets at the time interval specified by the Integrator. The time convergence takes is dependent on how often control packets are sent. For example, if control packets are sent twice a second, a 100 node dense network will converge in about 2 seconds. The OrderOne Networks Mesh Network Routing Protocol is easily able to organize networks that are very large and very dense, while never using more than a fixed maximum control packet bandwidth. Once the network has converged the control packet sizes drop to less than 11 bytes. These attributes are unique to the OrderOne Networks Mesh Network Routing Protocol.